In addition to the difficult emotional toll of cancer treatment, many chemotherapy patients experience chills even when in a warm environment. 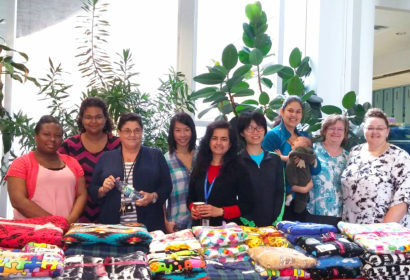 To help with both challenges, the Goodman Cancer Research Centre (GCRC)’s Hugs for Hope volunteers hand-craft plush fleece pillow blankets and gift them to patients of all ages. The blankets feature colorful prints and cheerful patterns to reflect the group’s mission of support and encouragement. Hugs for Hope is funded through the sale of blankets to the general public: for each blanket sold, one blanket is donated to a cancer patient. All funds raised are invested into making and donating more blankets. For more information, see the GCRC Hugs for Hope website.